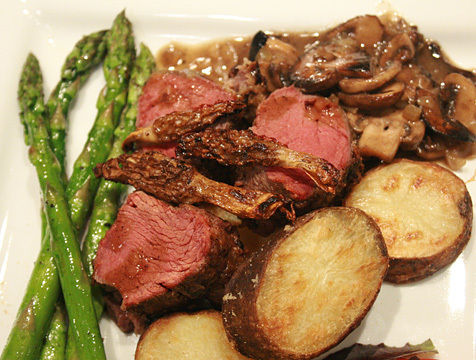 Kangaroo Loin with Mushroom Sauce | Have YOU Ben Starr Struck? Notice those lovely fried morels on top! I foraged those in Arkansas earlier this week and needed a VERY special dish to serve them with. **PLEASE NOTE** A video on how to make this dish is located at the bottom of this recipe! Yes, yes…you’re shocked and a bit disgusted that I’ve posted a kangaroo recipe. Folks…kangaroo is the venison of Australia. It’s their most common game meat. It jumps into the road in the middle of the night and destroys your car, just like a deer. It is hunted with guns, bows and arrows, and traps, just like deer. And kangaroo meat is absolutely superb…when properly prepared…just like venison. Kangaroos are herbivores with chambered stomachs, just like cattle, sheep, and deer, and their meat is astonishingly similar thanks to their diet of grass and weeds. And since I am on the shortlist for Tourism Australia’s Best Job in the World…”TasteMaster” of Western Australia…I figured this would be a very appropriate recipe for me to share this week. Notice this label is in both Dutch and French! But first of all, where do you even get kangaroo meat? I source mine from Arrowhead Specialty Meats right here in my hometown. While you’re not likely to run across it in your grocery store, most specialty meat markets carry kangaroo and will sell directly to the public (though their primary customer base is restaurants). So just Google your city name or zip code, plus “specialty meats” or “game meats” and you’ll find one. Or ask the chef as your favorite gourmet restaurant where he gets his unusual meats, and he’ll be happy to tell you. Kangaroo meat, just like venison, is incredibly lean…as lean as a boneless skinless chicken breast. This means that, if you like red meat, but are watching your saturated fat and cholesterol intake, kangaroo could be a lifesaver for you! However, this almost complete lack of intramuscular fat means that it can be challenging to cook kangaroo meat and end up with a juicy, tender cut of meat. The leg meat is unsuitable for pretty much anything but long, slow braising, or grinding into sausage. The loin, however, is a different story! It runs along either side of the spine and doesn’t get nearly the exercise that the legs do. This is where the “filet mignon” is cut from beef. So look for kangaroo loin, and you’ve got an outstanding cut of meat. There’s no need for salt, because the meat is already perfectly seasoned. Dredge the loins in the seasoned flour. Add the loins, one at a time, searing for about 60 seconds on each side, until each loin is nicely browned all over. Remove them to a pan and let them rest. Preheat the oven to 325F and place the rack in the center of the oven. Return the heat to high and boil rapidly until the stock is reduced by half. While the stock is reducing, place a probe thermometer in the thickest part of the kangaroo loin. If you are cooking several loins of differing sizes, put the thermometer into the smallest loin. Place them into the 325F oven and roast until the internal temperature reaches 120F. Remove them from the oven and let them rest for at least 10 minutes before removing the thermometer or cutting them, or else they’ll lose all their juices. Just smoosh them with a fork until they are completely mixed into a thick paste. Once the chicken stock is reduced by half, lower the heat to medium and begin adding bits of the beurre manie, whisking constantly, until the sauce begins to thicken. Return the mushrooms to the pan, reduce the heat to low, and let the sauce simmer for several minutes. Keep the sauce warm until serving time. When the loins have fully rested, cut them into slices and spoon the sauce on top. And enjoy your very first taste of an incredible meat that, while very much like beef in terms of texture, has a mild and exotic flavor all its own. You’ll be hooked! This entry was posted in Blog, Main Courses, Recipes, Travel and tagged #bestjobs, #TasteMasterWA, Australia, Best Jobs in the World, game, kangaroo, loin, steak, Taste Master, venison. Bookmark the permalink. I found this while looking for a recipe of what to do this easter as it is my first easter in Australia and seeing as my sister is visiting I thought maybe kangaroo loin would be great. Thank you for this! I tested it out just to see if I wouldn’t burn the house down and it is delicious! My husband and I just moved to Brisbane about two weeks ago for school. I found this recipe on Youtube because we went out and purchased a Kangaroo rump, and I had no idea of how we should cook it. I know rump and loins are different, but the preparation for cooking I think is the same. I am really glad you told us about how to brine the meat. The only thing I was missing was the meat thermometer. I had to just take my chances and pray it would not overcook. I ended up making a rump roast, and made your mushroom sauce too. The meal impressed my new French friends! Thank you, I hope you ended up being the taste master. ben you have made me interested in all kinds of different types of meats now. thank you, it is now one of my summer goals to try something wild! i had deer enchiladas once and i have to say it was not good! so i will be brining the meat for a long time and trying it with caution and lots of garlic and pepper! lol. Ha ha ha… Tanya, game meats can be the most delicious thing EVER in the hands of a knowledgeable cook…or they can be downright horrid. This is because game meat arose out of the hunter/gatherer tradition, when food was a necessity, not a luxury. And many folks who hunt now are much better at hunting than they are at cooking. All game meats can be exceptional if they are cooked PROPERLY. I’ll admit I was a bit shocked at first, but I never knew kangaroos are to Australians like deer are to Americans. Very informative!